I spent a week doing work experience at CNN (Turner Broadcasting), working partly in the business side and partly in the newsroom. It was an incredible experience. I met smart people, sat in on fascinating meetings that gave me a real insight into the way the media business works, and was able to actively contribute. I’ve had my blog for three years and have constantly asked myself questions about how to build an audience, what content resonates with people and what strategies work best for engagement. It was fascinating to find that CNN/Turner Broadcasting, an organisation that reaches billions of people each and every week, routinely ask themselves virtually the same questions. Of course the scale is much grander and the stakes higher, as they are a business and need to generate income, but much of the discussion was around content and audience engagement. It was thrilling to gain insights into how it all works. I’m pleased to say that the team put me to work while I was there. One highlight was researching and curating my millennial thoughts on CNN's new internal startup, Great Big Story. It creates such good content, and tells fascinating and powerful stories, so I highly recommend checking it out. Below is one of my favourite videos they've created. I spent a day (and one very early morning) working in the newsroom. 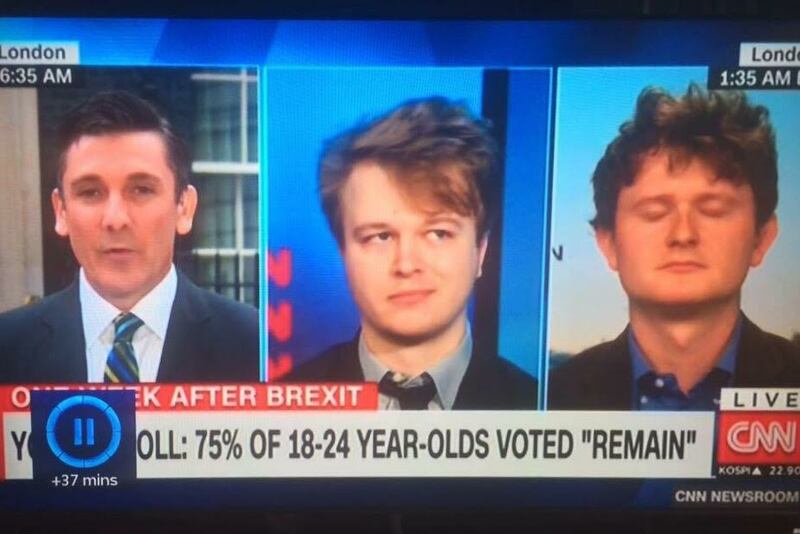 One of the highlights was producing a piece on Brexit for the breakfast news show. I was asked to track down two under-24 year olds with opposing views – one who voted to leave the EU and one who voted to remain for an on-air debate. I managed to find them, pre-interview them, and then booked them to go on air the next morning. I volunteered to go to the studio just off Oxford Street at 6:30am to watch from the control room as the piece went out. It also meant I could make sure that the two guys turned up and on time! It was a very rewarding feeling, seeing something you organised go out on live TV. It was a great piece, see a screenshot below. I went to a conference by Westminster eForum, and heard insights on the future of monetising digital content from people from CNN, Deloitte, News UK, Featured Artists Coalition, The Lad Bible and more. 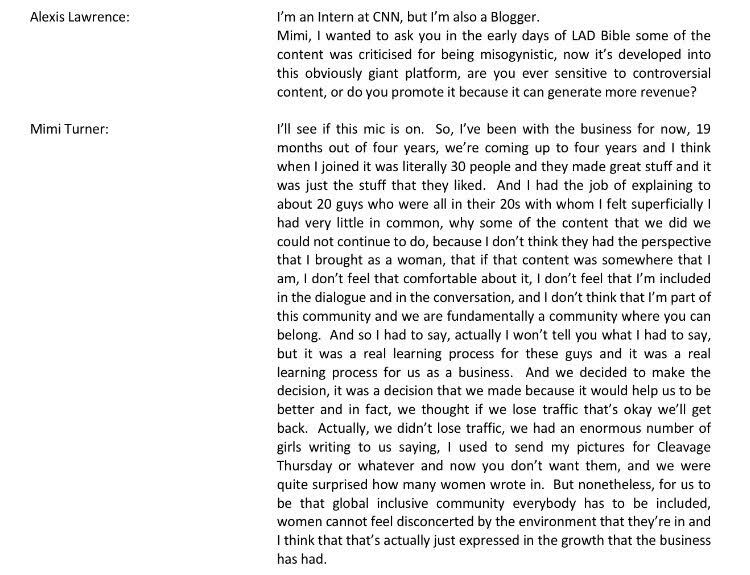 During the panel discussion I asked the marketing director of The Lad Bible, Mimi Turner, a question on misogyny. You can see the transcript of below. I was engaged throughout the whole conference, especially as digital content is something I invest a lot of time in. One of my more lightweight, but very enjoyable, tasks was to screen cartoons for airlines for sensitive content (Turner Broadcasting owns Cartoon Network). I am well versed in the Power Puff Girls relaunch and We Bare Bears, which has honestly become one of my favourite shows. It was a wonderful experience for which I am enormously grateful. Thanks to Greg, Natalie, Owen and the rest of the team for being so welcoming and generous. Thanks, too, for asking for and listening to my views; for giving me real insights into such an extraordinary business; and for the opportunity to contribute. This looks like such a great work experience gig, I'm so jealous!